Through donations from the National Heritage Memorial Fund (NHMF), the ACE/V&A Purchase Grant Fund, private individuals and Friends of Kelmscott Manor, the ‘Homestead and the Forest’ cot quilt, designed by May Morris and embroidered by Jane Morris, has been acquired by the Society of Antiquaries of London. After more than 70 years in private hands, this important work will now have a permanent home at Kelmscott Manor and remain accessible to public audiences. Kelmscott Manor is the former Cotswolds retreat of William Morris, designer-craftsman, writer, socialist and pioneer of the Arts & Crafts Movement. Morris took a joint lease on the house in 1871 with Pre-Raphaelite artist, Dante Gabriel Rossetti. Morris referred to the Manor as his ‘heaven on earth’, and some of his greatest designs and ideas were inspired by this rural retreat. For May Morris (1862–1938), her ‘beloved Oxfordshire home’ was equally inspirational. This exceptional textile depicts a child-like representation of the Manor amidst a delightful miscellany of wild and domestic animals, birds and fishes – including foxes, a giraffe, elephant, tiger, crocodile and bear. It was designed by William Morris’s younger daughter, May, who knew and loved the Manor from the age of nine, and was embroidered by his wife, Jane, in 1890. May Morris was a talented embroideress and designer, and embroidery historian. In 1885, aged only 23, she was appointed Director of Morris & Co’s embroidery department and remained in the role until 1896, the year of her father’s death. Under her leadership, the company executed some of the finest embroidered work of the day. When the quilt was exhibited in 1890, it was praised for the complexity and originality of its design. The borders of the piece are decorated with proverbs and quotations, which show how closely May was aligned with the socialist ideals of her father. May retained the quilt, proudly showing it to visitors along with other prized possessions at the Manor. She kept it until her death. 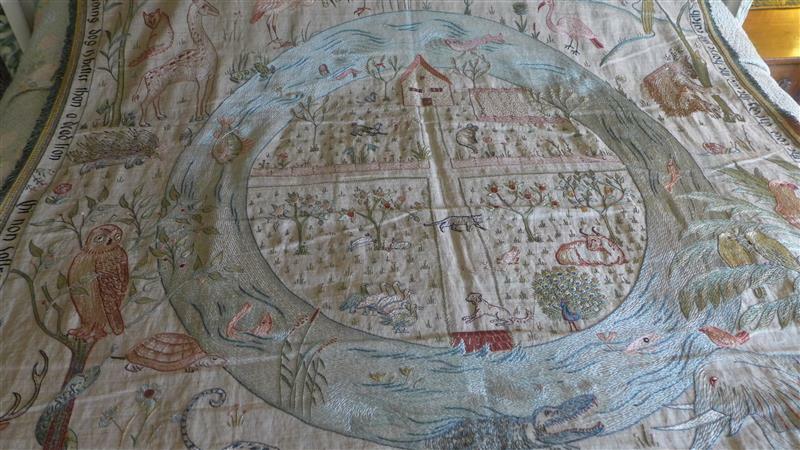 The cot quilt was acquired by May Morris’s friend, May Elliot Hobbs, in 1939 when many of the contents of the Manor were sold off following May Morris’s death. It remained in the Hobbs family until its recent acquisition. May Elliot was the daughter of a Scottish agriculturalist, and in 1906 she married successful Kelmscott farmer and stock-breeder Robert Hobbs, who happened also to be Morris’s Kelmscott Manor landlord. The two women, both deeply concerned with rural issues and women’s role in society, became friends and together founded Kelmscott’s Women’s Institute in 1916, one of the earliest Women’s Institute’s in the UK. They were also the leading lights of Kelmscott village life and social activities. The embroidery will be on display at Kelmscott Manor throughout the 2016 Open Season (every Wednesday and Saturday between 2 April and 29 October). A media pack, including a copy of this press release and images of the ‘Forest and the Homestead’ cot quilt, areavailable for download. Kelmscott Manor was the former Cotswolds retreat of William Morris, his family and his circle. The Manor is owned by the Society of Antiquaries of London, of which William Morris was a Fellow. The Manor recently received the Best Small Visitor Attraction – Gold Award 2014 from Cotswold Tourism and has been shortlisted two years in a row by the Museum and Heritage Awards and Guardian CulturePros Network as the ‘Most Inspiring Museum or Heritage Attraction in the UK’. Kelmscott Manor attracts approximately 21,000 visitors a year, and is open Wednesdays and Saturdays (11am to 5pm) from 2 April to 29 October. More information can be found on theKelmscott Manor website. Founded 1707, the Society of Antiquaries of London is Britain’s oldest learned society concerned with the study and understanding of the material past. Their Royal Charter of 1751 sets out our purpose as ‘the encouragement, advancement and furtherance of the study and knowledge of the antiquities and history of this and other countries’. Today the Society is a registered charity (207237) with an elected Fellowship of more than 3,000. More information can be found on theSociety's website. The Arts Council England/Victoria and Albert Museum Purchase Grant Fund is a government fund that helps regional museums, record offices and specialist libraries in England and Wales to acquire objects relating to the arts, literature and history. It was established at the Victoria and Albert Museum (V&A) in 1881 and continues to be part of its nationwide workThe annual grants budget, currently £750,000, is provided by Arts Council England (ACE). Each year, the Purchase Grant Fund considers some 200 applications and awards grants to around 100 organisations, enabling acquisitions of over £3 million to go aheadMore information can be found on the Grant Fund's website.